Piercing line is a bullish reversal candlesticks pattern. It is the opposite of dark cloud cover. In order to provide valid signals a downtrend must be in place before the pattern occurs. Bellow follows its graphical representation. 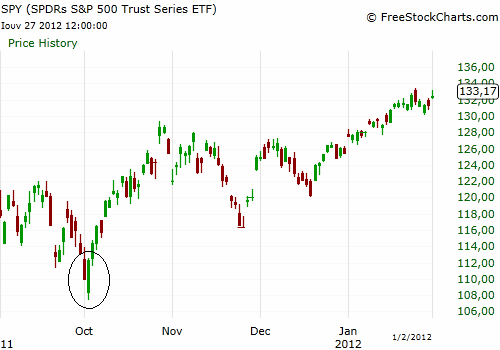 The green candlestick opens with a gap down but in the end it closes above the midpoint of the red candlestick. This is a sign that after a price decline buyers are taking control again. A piercing line pattern at ETF SPY (below), ended the mid term bear market that has started from May 2011 until October 2011 and signaled a new mid term bull market which lasted until April 2012. 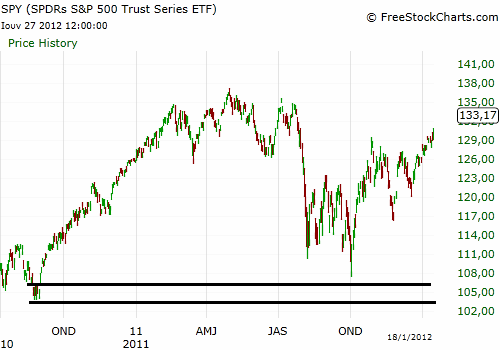 A strong support zone was also present at $106 at SPY chart (below) coming from September 2010. That day market sentiment was extremely bearish and only the cold, unbiased observation of price charts could have warned for a potential reversal. At the same day many individual stock charts had similar patterns. 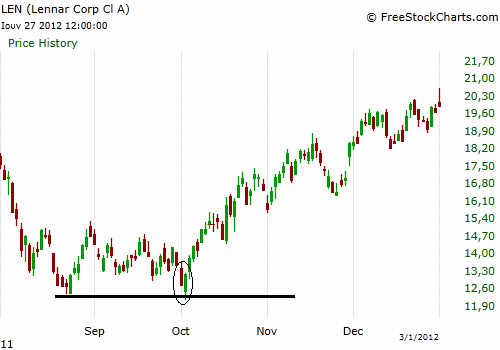 LEN daily chart below had also formed a piercing line pattern on a previous support level. A long entry at this point should be followed by the placement of a stop loss order a few cents bellow support. Generally, in swing trades that are based on candlesticks patterns, the optimal time to enter is when the market is near its close because we want the pattern fully developed and with little chance of changing after opening the position.